First off, I can’t resist even a mini-DBQ, so, can you tell what species this is? Second, this case got me thinking about how we count dead birds and how to account for their persistence (or lack thereof) on beaches. As I begin analyzing data from the past two or three years, I am interested in looking at these tagged birds in particular. Once we instituted the numbered aluminum tags, how many of them were resighted on later surveys? How many were never seen again? How does this differ across beaches? And moreover, 588 shows us how long wings can stick around. Who knows how long dead 588 was when it turned up on Warren’s beach in the first place? How long can a set of wings and a sternum drift around before landing on a beach? And if wings can stick around for so long, are they really useful in trying to track mortality through time? If a set of wings might be from a bird that died a year previous, should it be counted, for instance, in an acute mortality event, or should only intact carcasses be used for that? Lucky for me, there are actual trained scientists with trained scientific minds who can help me sort this out as I tackle the data. We shall see what it all yields. Snow is general across New England today. I can’t actually open my front door due to four foot snow drifts, but the view of the mounting piles and sideways blowing snow hints at the conditions. A couple of our Seanetters have written, pondering what they might find on their beaches once this blizzard winds down. 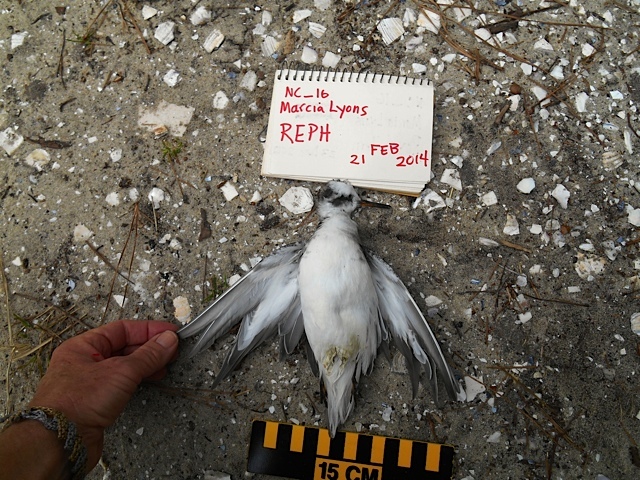 Dennis Minsky closed his email to me with the words, “God help wildlife tonight.” Indeed, post storm, we do often see upticks in seabird mortalities. Species groups like alcids, already on a knife’s edge of survival during the harsher months, can be pushed over the edge by a bad storm and turn up in wrecks along the shores or even well inland. Storms can be one of the many stressors that may converge on wildlife and lead to mass death. A new paper out in the Proceedings of the National Academy of Sciences looked at patterns of these mass mortality events (MMEs) over decades and across multiple classes of organisms. Their findings do much to elucidate some causes of these events, but also to point out the challenges in tracking, reporting, and measuring them in wild populations across the globe. 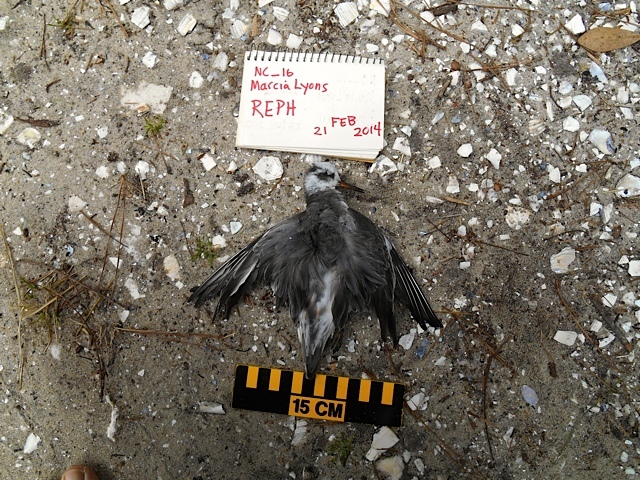 Some die-offs may simply be more conspicuous due to geography and timing, and others may remain unreported and undocumented simply because of the obscurity of where or when they occur. Some of it comes down to a variant of the tree-in-the-forest question: “if thousands of alcids die in the Atlantic, and no one is there to count them, does it make a sound?” The authors of the paper had to grapple with determining how many MMEs happen, and how may get reported in the scientific literature. Overall, these researchers have striven to account for these kinds of observation bias, and though it cannot be entirely eliminated, their general findings are quite interesting. MMEs were rarely reported at all prior to the 1940s, so the authors of the study analyzed only the reports since then. As you can see in the figure below, the number of MMEs documented (and we know not all are documented) has increased in general–the colored bars show the number of events reported for each five year interval. The apparent declines in numbers of MMEs in most of these groups over the past decade is due at least in part to the delay between when an event occurs and when a scientific paper is finally published on that event, which can take years or even decades. The dashed lines show the upward trend in scientific papers published on MMEs, and it reliably increases across all groups. What these particular graphs do not show is the magnitude of each MME. 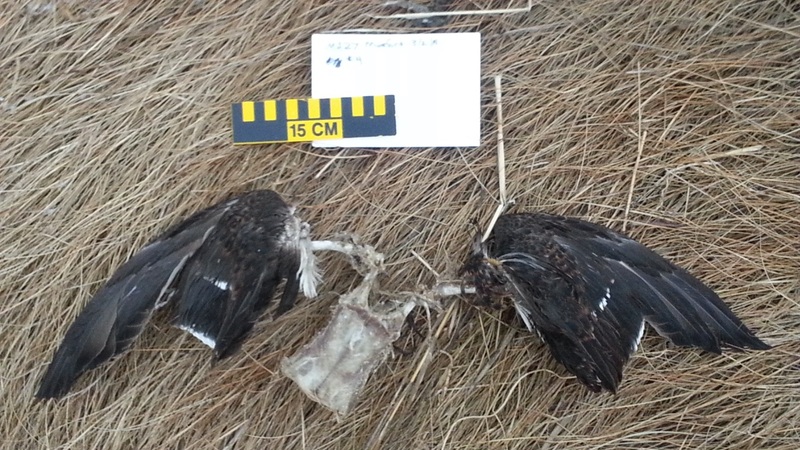 Some die-offs are truly massive, and others are on a smaller scale. Further complicating the issue is the overall population size of the species. In a very common species, millions of individuals could die, drawing a great deal of human attention to the spectacle, and yet have little impact on the population’s overall viability. A very rare species might lose only a hundred of its number and face local or regional extinction without attracting much, if any, human attention. The differences in MME magnitude varies across different taxonomic groups too. 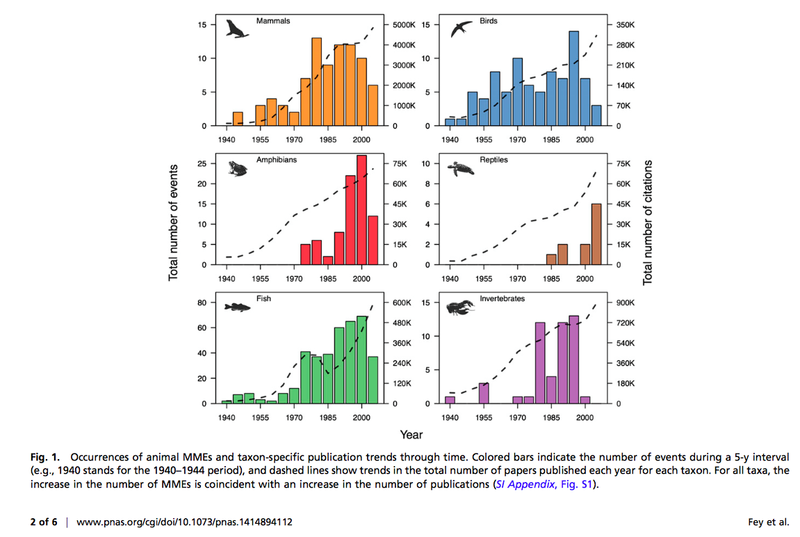 In other words, the trends in magnitude of die-offs in amphibians do not hold for birds or mammals. The reasons for this are not simple or straightforward. There are several factors that may be at play, and sorting them out is challenging. The scientific community does shift in its foci over time, and while disease or toxic algal blooms may be in the spotlight for several years, interest in those can wane as scientists shift toward a focus on prey availabilty, or climate change as drivers. This is not either/ or of course, but these kinds of shifts do play a role. If we have not had entirely consistent attention on all the different potential causes of MMEs across all taxa, then we may have missed some significant ones while attention was turned elsewhere. In addition, there are the issues of scientific advances, which have made it possible to pinpoint causes of MMEs like algal toxins or viral diseases that simply could not be diagnosed fifty years ago due to lack of technological ability. These researchers also point out that, while scientists travel the globe in the course of their work, coverage is not uniform. Many more investigators are at work in Europe and North America, for instance, than in most regions of the developing world. These biases can lead us to miss entirely die-offs that happen in these less scrutinized regions. What does appear clear is that, rather than pinpointing a single cause of wildlife die-offs as the main culprit, the number of events due to multiple stressors is likely to increase. Climate change can induce thermal stress on organisms not adapted to warming oceans, prey availability can threaten the survival of creatures already marginal in their foraging, and increasing severity of storms, droughts, and floods will converge on these species more and more often. Human-introduced pathogens will continue to pile on as well. What this paper tells us is that, in addition to doing whatever we can to address these threats, we must also make sure scientists are continuing to focus on mass mortality events. Interestingly, it is still the case that most wildlife mortality events are reported only in newspapers, and never make it into the primary scientific literature at all. All the more impetus for me to finish up verifying all your volunteer data and get some publications out on seabird mortality on the east coast. 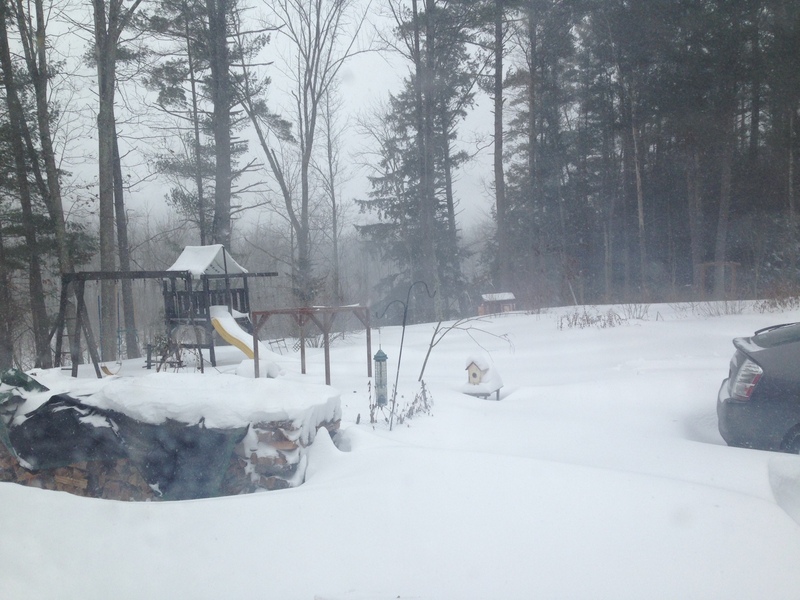 I suppose a blizzard day is a good time to hunker down and do some of that work. On last week’s Dead Bird Quiz, we ended up with more responses than I had anticipated! Edward and Wouter engaged in a bit of back and forth in the comments, and both concur that this specimen, pathetic as it is, is too small for an oystercatcher. Their verdict ended up being some sort of plover–most likely semi-palmated or Wilson’s (and they can be hard to distinguish even when there’s a lot more left than some wrung out old wing pieces). The reported wing chord on our mystery bird was 11cm, which would place it in the range for plover and sandpiper types to be sure. Oystercatcher is not in either of our Field Guides, so I had to go searching for the wing chord data, but the fabulous American Oystercatcher Working Group has those data readily accessible, and there I find just what Edward and Wouter both pointed out–wing chords for AMOY would be more than twice the length of the little wings we have here. So, we will leave it in the database as “Unknown plover” and go off feeling pretty good about ourselves. 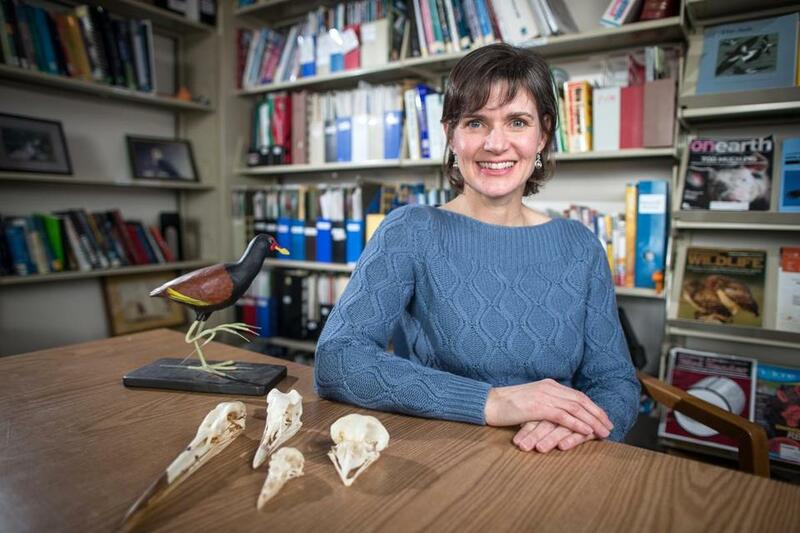 Over the weekend, the Boston Globe did a (very) short piece on the Common Eider die-offs and our own Dr. Julie Ellis’ work to get the Northeast Wildlife Disease Cooperative up and running. Check out the article, which also mentions SEANET! I also wanted to share with you this article in National Geographic on whales and dolphins and the potentially fatal results of ingesting ocean plastics. In late February, I will be participating in a panel addressing the issue of trash in the environment generally. For those of you on Cape Cod who might like to attend, details shall be forthcoming. I managed to harangue an answer out of Edward! Hurrah! 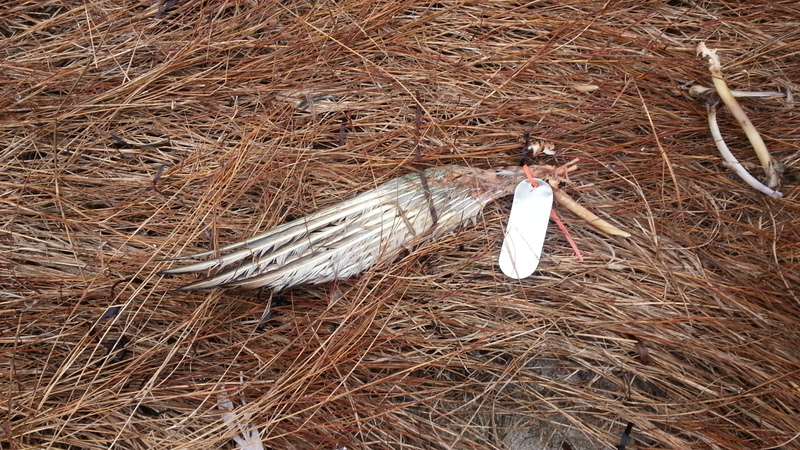 Also, it makes me feel better when other people find a carcass as daunting to identify as I did. Looking at our Bird here, there’s not a lot to go on, but we might get farther than we expected on initial inspection. We can see the sternum of the bird here, and it looks small, delicate, and roughly square shaped with some indents along what we would call the caudal border (caudal refers to the tail end of an animal). This looks like a shorebird’s sternum to me, and Edward agreed, referring to it as “very charadriform” (the order that includes shorebirds). 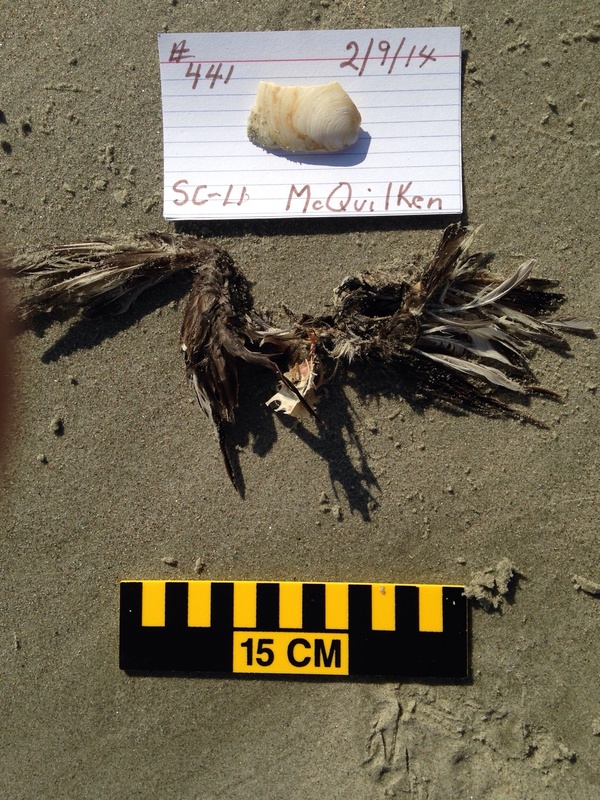 Interestingly, the sternum looked almost like a mini-gull sternum to me, and when I thought about it further, it occurred to me that gulls and terns are also Charadriiformes, so no big shock there. This bird in the DBQ is quite small, as one can see using both the ruler and index card as reference. So, we are looking for shorebird types with a dark wing. What other field marks can we make out? It looks like there’s a white band running along the upper wing, and in the photo of the underwing, it looks pretty bright white. What species have a white stripe on the upper wing with a white underwing? Edward suggests one: oystercatcher. Check out this photo below. The upper wing shows a strong white band tapering to not much more than a few white patches on the inner primaries. The underwing is a clean white. This bird is an adult, and the bird we have is browner overall, which would be consistent with a younger bird. This does look promising. Interestingly, Pacific populations of American Oystercatchers lack those extra white patches on the primaries, with the white restricted to the secondary coverts. I think oystercatcher is a good bet for this bird, but I have some hesitation. I was doing my own SEANET walk the other day on the ice-stacked beach, and was trying to think of other things it could be, mainly as an exercise. We don’t get a lot of shorebirds, and I am not excellent at identifying them. But as I walked along, I saw a Sanderling take off just ahead of me, and saw its wing flash a white band as well. So, thought I, what other shorebirds show that pattern that we might take a brief look at for our own edification? There are plenty of birds, like the Willet, that are known for a conspicuous white wing stripe, but that have a dark underwing. We can discount these. But that leaves us with several birds that still meet the requirements. It’s hard to tell just what that white band looked like in life in our Dead Bird, but from what I can see, it looks somewhat more extensive and uninterrupted than the patches on an oystercatcher’s primaries. There are some birds in this size range with a white underwing and a broader white stripe extending well into the primaries. These include Sanderling, Ruddy Turnstone, Red Phalarope, and Dunlin. The size looks too big for sandpipers, though some species of them have this sort of coloration on the wing. None of these options is without precedent on SEANET beaches, and this seems a good opportunity to show these lovely photos of a Red Phalarope that Marcia Lyons found in North Carolina last February, though this bird was rather uncooperative about spreading its wings per SEANET protocol. Also, the phalarope has grayer wings than we see in our bird. Overall, looking at all these other options, it looks like the general, somewhat dark, drab brown color of our bird is not quite right for the flashier, more rusty or spangled color of, say, a Turnstone’s wing or a young Dunlin. 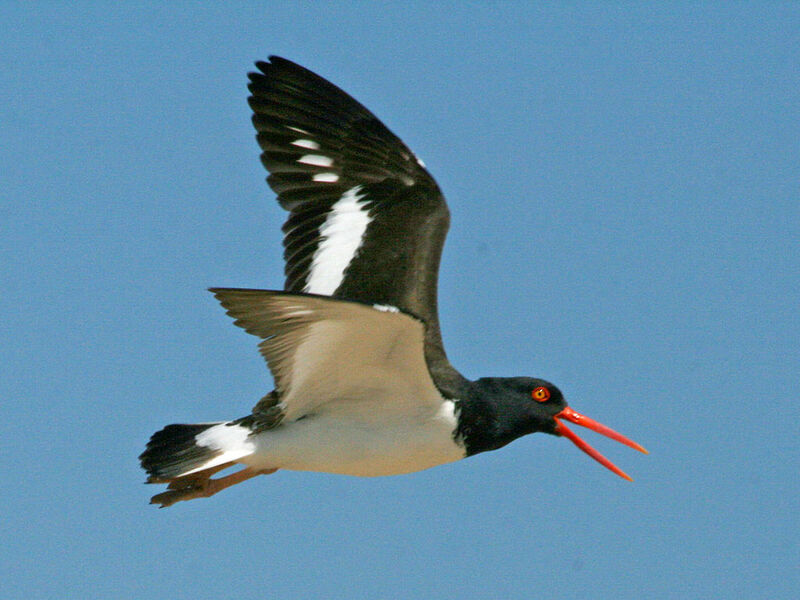 So, after casting about for a while, I feel pretty comfortable with the oystercatcher call. What this has mostly taught me is that, whenever I think I can tackle shorebird identification, I am probably wrong. Especially when all that’s left is a twisted up bit of mostly nothing. But thank you all for bearing with me. Dead Bird Quiz plus live bird bonus! 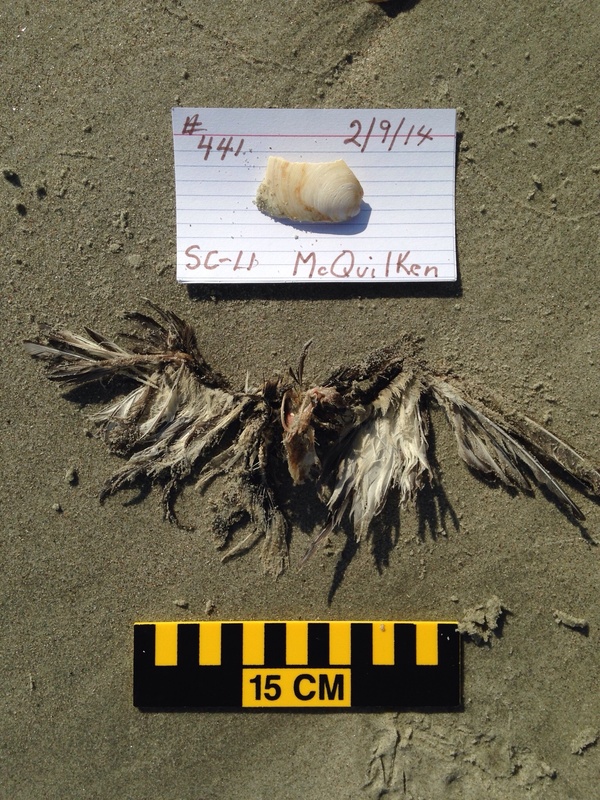 One dead bird for you today: a wing and sternum combo out of South Carolina courtesy of Doug and Gina McQuilken from just about this time last year. It’s in pretty rough shape, but I can make out a few features that could help us make this i.d. Tell me what you think. Upper surface (partly anyway. it’s rather twisted up.) Underside of wings. And now, for a decidedly livelier bird. This one was spotted by Tom McFeely of Beaufort, SC. He spotted this bird in Port Royal, South Carolina. I found this photo so striking, I thought I’d share it with you all. 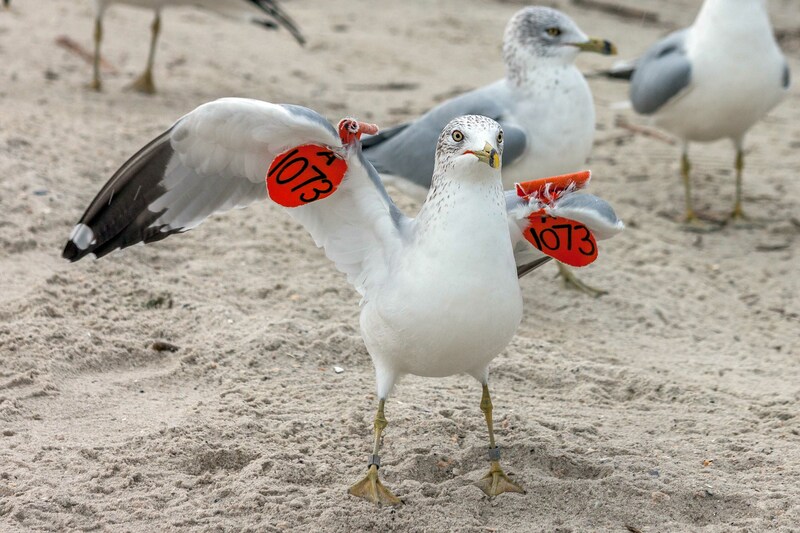 We passed along this sighting to Dan Clark here in Massachusetts, who runs the tagging study on these Ring-billed Gulls, and he told us the history on this bird. 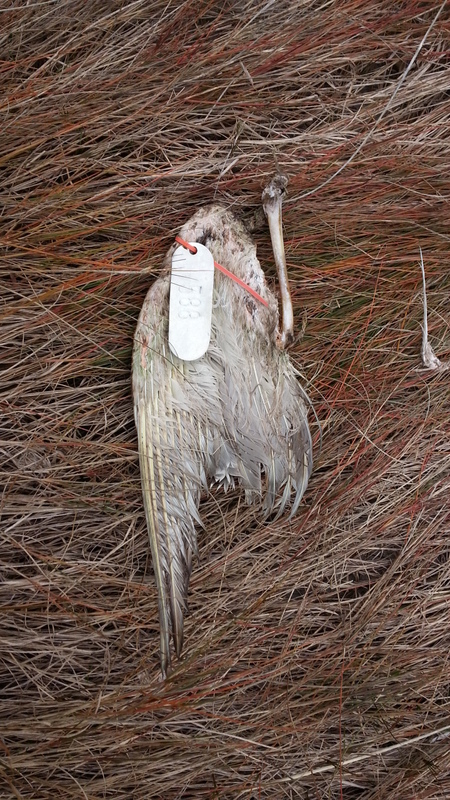 Evidently, it is a male, initially captured 3/28/2013 at Webster Lake in Massachusetts using a net launcher baited with bread, crackers, and French fries (the classic gull trifecta). Since then, the bird seems to spend summers in Quebec and winters in South Carolina, passing through New England during the trips in between. For most of its history, the field of wildlife management largely ignored or dismissed the role of disease in wildlife populations. Not to say they denied the existence of disease, certainly they did not, but for many years, its role was seen as one of natural correction: when populations grew too large or dense, a disease outbreak would prune down those numbers, bringing the population back to a sustainable level. Indeed, for millennia, this was the case. Now, the study of wildlife disease and disease ecology is booming. What happened? We did. When wild populations evolve alongside their diseases, be they viral, bacterial, parasitic, or otherwise, the two are engaged in a constant arms race. Pathogens evolve new ways to infect and spread, and hosts evolve new defenses. This dynamic breaks down, however, when a pathogen infects a host population with no previous exposure or defenses. In human history, there were the infamous smallpox outbreaks among Native Americans upon first contact with Europeans. The Pilgrims arrived in a land largely emptied of its native human inhabitants after they were nearly annihilated by infections brought by previous European traders and their rats. Without natural immunity, what we call a naive population can be very nearly exterminated by a disease that coexists in ancient balance in another population. Things are not much different in wildlife. Wild populations exposed to new diseases carried across oceans by human travelers can face extinction when those diseases run unchecked through their ranks. We have seen this happen with the spread of avian malaria in Hawaiian songbirds, and with the Geomyces destructans fungus that causes White Nose Syndrome in North American bats but seems to cause no harm to its normal European host species. As awareness has spread of the threat posed by disease in wildlife, people often ask why we can’t develop vaccines to combat them. The typical response is that it would not be practical. For many reasons, this is true. First, developing a vaccine is expensive and without a large scale market for the product, it’s not likely to get done. Wildlife medicine doesn’t pay well, I can tell you from personal experience, so the economics alone are daunting. Second, not every disease is well suited to vaccination. We mainly vaccinate against viruses, though some vaccines (Tetanus, Diphtheria, e.g.) target the toxins released by bacteria. Even within viruses, some are stable and relatively unchanging, while others are constantly mutating. This is why we have a standard vaccine for rabies (stable), an annually shifting one for flu (not so stable or consistent), and no vaccine for HIV (constantly mutating). But let us assume we had a vaccine on hand that could combat a particular disease threatening a population, and that we knew we could capture enough individual animals to administer it to a high percentage of the population. Even then, there are challenges. When I was a first year vet student, I had to get a series of rabies vaccinations. We all did, given our line of work and our higher than average risk of exposure. After that initial three shot series, we were told we should have a titer checked every two years to make sure we are still protected. A titer tests the blood to see what level of antibodies are still patrolling for a particular virus. So far, every two or three years, my titer has shown that my body is still alert to the threat of rabies, and if the virus did find its way into my body, the level of antibodies in my system would be sufficient to neutralize those viral particles and destroy them. The reason I have to be checked so often is that this response is variable. Some people never need a booster shot after receiving the series. Others do. The level of antibodies can decline over time. Knowing how long a protective level persists is critical to any vaccination plan, so when contemplating vaccinating a wild population, we must have a sense of how long the protection will last. If an animal would require annual boosters, that vaccine is not likely to be of much use long term in wildlife where capturing individuals repeatedly ranges from difficult to impossible. The question of vaccinating wild animals must also encompass the life history strategy of the particular species. Many seabirds, for instance, are extremely long-lived, and their population structure is based on an extended juvenile or subadult phase, low annual reproduction, but a tradeoff in many, many years of reproduction (for a particularly amazing example, read about Wisdom). In such birds, if a vaccine were found to lead to multi-year protection from a serious disease, the balance could tip toward attempting it. Thinking along just these lines, a team of researchers set out to study vaccine responses in Cory’s Shearwaters, another long-lived seabird species. 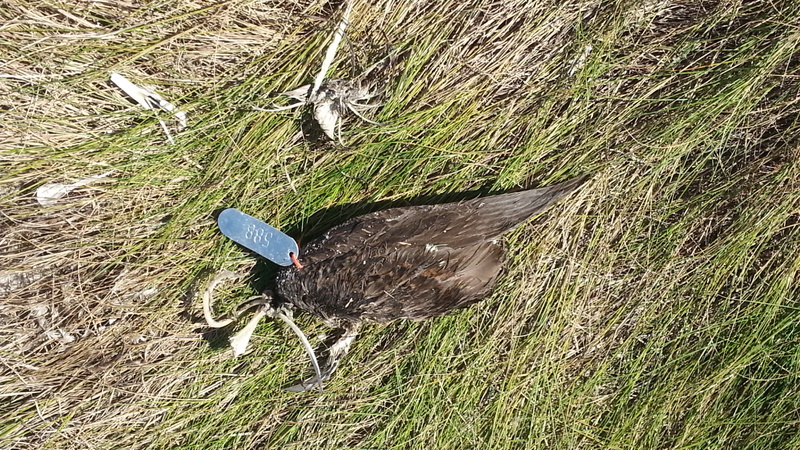 Some seabirds are susceptible to Newcastle Disease Virus, a potentially deadly disease that also affects domestic chickens. 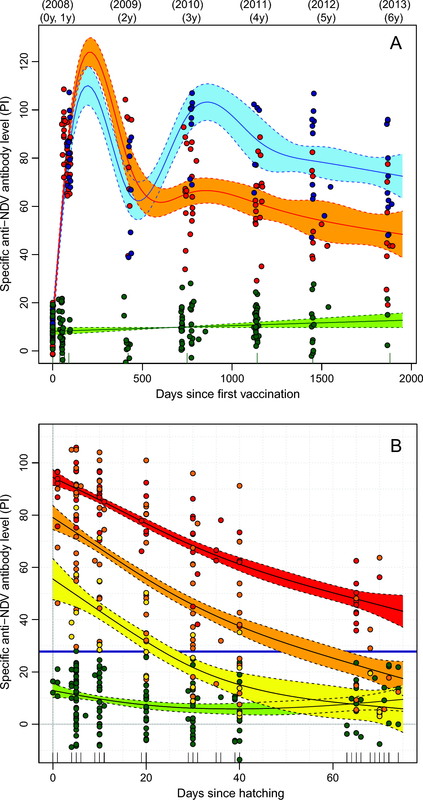 Given that last point, there is a vaccine currently available for use in poultry, and these researchers administered it to shearwaters instead and then tracked not only their own bodies’ responses over a period of years, but also how the antibodies passed into the birds’ eggs and persisted in hatchlings. What they found was that the adult birds did mount an immune response to the injection and that the antibody levels in their blood rose quickly, and then gradually declined over a period of years. Some of the birds received a booster shot a couple years after the initial one, and the antibody levels rose again in response to that. Levels of antibodies passed to the chicks as the egg was forming persisted after hatching, and the higher the levels of antibodies in the mother at the time of reproduction, the higher the levels in the chicks. Antibody levels in adults (upper graph) and chicks (lower). Green bands are from unvaccinated birds. Orange band on upper graph are adults vaccinated once. Blue band are birds that received a booster shot two years into the study. Just as every virus is different, every vaccine is different, and the results from this study do not mean that all vaccines would result in persistent antibody levels for several years. 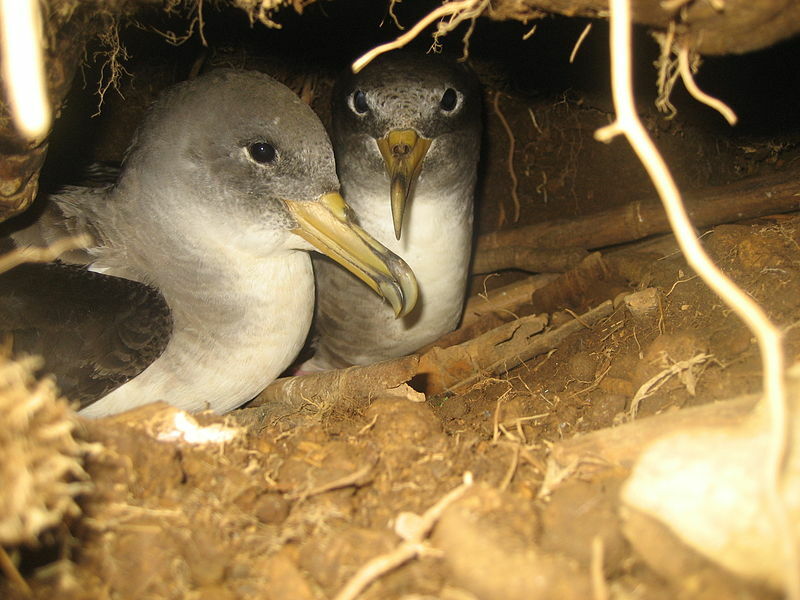 Additionally, what made this multi-year study possible is the site fidelity of shearwaters and other seabirds, many of which return year after year to the same exact burrow or nest site, and can be captured and resampled reliably. For many wild animals, this type of resampling is simply impossible, as would be booster shots. Finally, this was a study aimed at determining persistence of antibody levels, not at actually protecting the population from Newcastle Disease. Generally, something around 80% or so of the population need to be vaccinated to keep a disease from spreading. To attain those kinds of levels would be incredibly labor intensive, and in many cases, not feasible. But this study is an indication of the rising profile of disease ecology in wildlife management, and an awareness that we must shift finally away from a view of disease as a natural corrector and toward viewing it as another of the anthropogenic threats we created, and that we must strive to address.